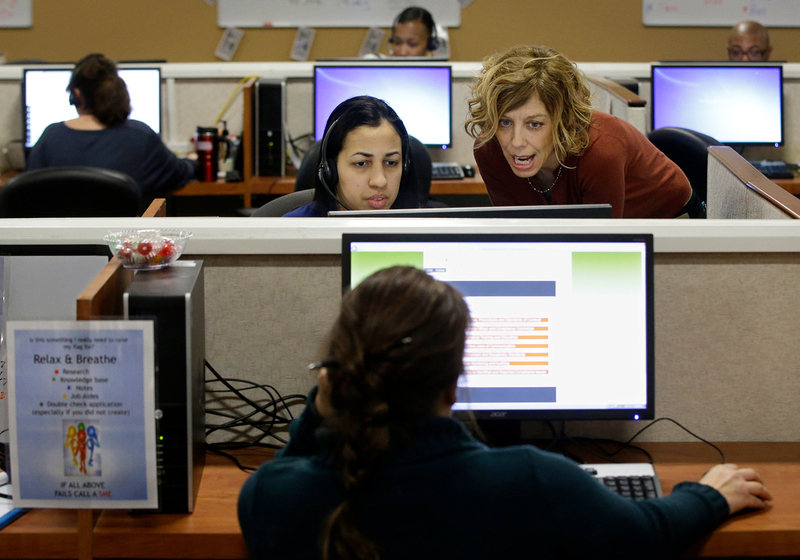 Meg Ivatti (right), a manager at HealthSource RI, the state's insurance exchange, works with Dianiri Paulino to help a caller sign up for coverage in 2014. Tuesday is the last day of open enrollment for health coverage for 2017 under the Affordable Care Act. And while Republicans in Congress are working to repeal the law, it's not at all clear what might replace it. During the campaign, President Trump suggested a nationwide insurance market that would allow insurance plans to be sold across state lines. The idea has been kicking around for years, and some states have tried it, including Rhode Island, where it didn't work too well. All Things Considered's Audie Cornish talked to Christopher Koller who was the Rhode Island's insurance commissioner when this option was offered. It's very hard to have interstate insurance. It means that a state has to accept the rules of another regulator. That means if a Rhode Island insurer was licensed in Massachusetts, we have to say that whatever they do in Massachusetts is good for us here in Rhode Island. It also requires significant work to coordinate rules and regulations. Insurance regulators are reluctant to take on this task. Let's say Rhode Island didn't allow limited benefit health plans. ... If we were to allow insurance to come in from a state that allowed those plans, and they sold them in Rhode Island, you'd have insurers offering policies that were against the laws and policies set forth by Rhode Island legislature. ... And if insurers are going to sell across state lines, you'll see more variation among states which makes it harder to coordinate and for insurers to operate across state lines. It's not [comparable]. There's a big difference between a hospital and an auto body guy repairing your car. We have a lot more auto body guys than we have hospitals. We don't compel auto body makers to take care of our car if we can't pay for it, but we compel hospitals to treat people if they can't afford to pay for it. We look at health care very differently from auto insurance. In Rhode Island we have one hospital system that has 80 percent of births in the state. [Insurers] need that in [their] network to be competitive. And I can tell you that if a national insurer walked into that hospital, and said, 'Will you contract with us?' the hospital would have no reason to give the insurer any discount compared to local established health plans have already. That national insurer can't offer a competitive product.